The 2014-15 Orlando Magic schedule gets started on October 28th, 2014 on the road against the New Orleans Pelicans. The Magic then return for their home opener against the John Wall-led Washington Wizards on October 30th, and take on the Raptors the following evening. Orlando wraps up the 2014-15 NBA Regular season on the road its final two games on April 13 and 15 against the Miami Heat and Brooklyn Nets respectfully. PrinterFriend.ly provides Orlando Magic fan with a printable 2014-15 NBA schedule. 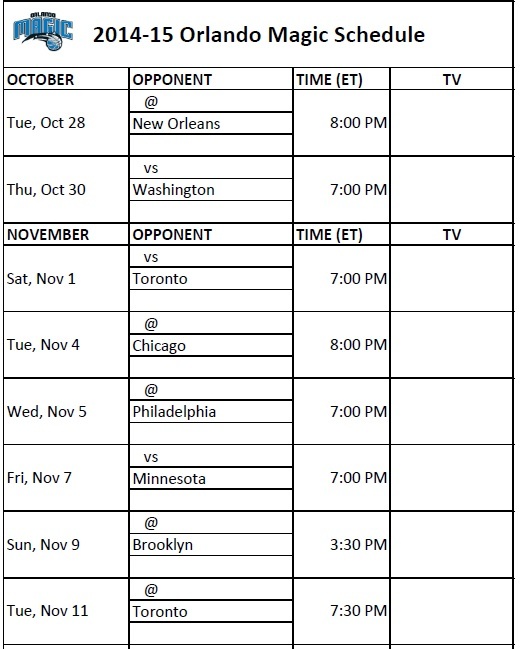 Those Magic fans and followers that would like to print their favorite NBA team’s schedule for the 2014-15 NBA regular season basketball schedule may do so.